Rules are made to be broken, and No Evil Foods has really changed the rules of plant-based meat alternatives with Pit Boss, their amazing vegan BBQ pulled "pork" that's tender, juicy, and darn delicious. Redefining Southern traditions in every bite, Pit Boss is smoked over real hickory chips, low and slow, then doused with made-from-scratch BBQ sauce that's made with the right mix of sweet and tangy for true BBQ taste and texture. One bite and it'll be easy to see why Pit Boss was selected as one of three honorable mentions in the Food & Drink category at 2016's Made in NC Awards. 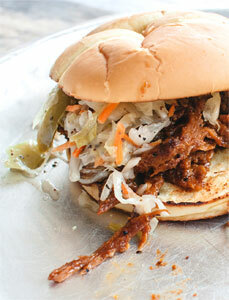 If vegan BBQ can impress omnivores this much, you KNOW you're gonna love it! 10 oz. (284g) package is $7.99. From Joanna of Chicago, Illinois on 11/12/2018 . Meh. It was ok. I wouldn't go out of my way to special order it. The "sauce" isn't very saucy- directions say to add a little water while heating up. I also added some bottled bbq sauce to improve/increase flavor. "Shred" texture was decent although when I have made something similar at home in the past, having longer "shreds" made the seitan texture closer to the real thing. A little too mushy overall and not enough chewy texture (t least I remember pulled pork and pulled chicken to be a little more stringy and chewy than this was. Better than nothing, esp when you are really craving that pulled pork sandwich, but I wouldn't go out of my way for it. I wouldn't get again but it certainly wasn't bad. Good in a pinch. From Suzanne West of Boulder, Colorado on 9/18/2017 . I've been a vegan for a very long time. I've never felt like I'm 'missing' something not eating murdered animals. But I was curious about the BBQ pork. It is fantastic!! I was really surprised that it was so good. I wouldn't hesitate to order it again. Absolutely delicious! This is much more successful than No Evil's other meats. The shredded pork was pretty good, and the BBQ sauce was acceptable. But $8 for basically 2 servings? From Kim Billings of Roaring River, North Carolina on 5/28/2017 . As a vegetarian of about 3 years, I've missed NC Pork BBQ. For me, this has taken its place. I'll keep it on hand.